Large trucks, tractor-trailers, and semi-trucks hold the potential to do a great deal of damage when involved in a collision. Most accidents involving a large truck result in injuries not to the driver of the truck, but to the driver of the other vehicle involved. Between 2013 and 2014, the rate of injury accidents where large trucks were involved rose by a stark 17%, according to the National Highway Traffic Safety Administration (NHTSA). 111,000 people total were injured in truck accidents, with 17,000 truck occupants injured in multiple-vehicle collisions, and 82,000 occupants of other vehicles injured in these collisions. Large trucks accounted for 8% of all vehicles involved in fatal crashes, resulting in 3,903 fatalities in 2014. Among all those fatally injured in a truck crash, 73% were occupants of other vehicles. If you’re involved in a crash with a tractor-trailer or 18-wheeler in New Jersey which was the result of the other driver’s negligence, be sure to take the following steps to preserve your right to compensation for your injuries. Report the accident to police: First and foremost, be sure that the accident is reported to the local authorities and that a report is created documenting the crash. This report will become useful later when pursuing your claim, and will likely be something that your insurer will require in order to process your claim. Seek medical attention: Be sure to visit a doctor as soon as possible after an accident. While you may not realize you’re injured at first, a doctor will be able to give you a thorough examination for lurking issues, and will be able to create a record of your injuries and symptoms. Document the scene of the accident: The position of the vehicles, the damage they incurred, and things like tire marks or damage to property can all provide experts with an indication of how and why an accident occurred. Take as many photographs as you can of the aftermath of the accident before vehicles are removed. You can also return to the scene of the accident with your attorney at a later date, to document any remaining evidence on the road at the site of the crash. Don’t admit to anything at the scene: Due to the high expenses involved in large truck crashes, insurance adjusters and representatives of the trucking company may immediately come to the scene of the accident to begin an investigation into what happened. Whether speaking to insurance adjusters, the other driver, or police, be careful about what you say. There may be a tendency to apologize for what happened, even if you know the accident ultimately wasn’t your fault. While your nerves are jangled and you remain in shock after an accident, do not accept responsibility for the crash, and do not sign any statements presented to you by an insurance adjuster. Speak with an attorney first. Find an attorney experienced in trying claims against truck drivers: Claims for personal injury damages after a crash with a large truck involve many legal issues specific to these vehicles. Large trucks fall under the supervision of the Federal Motor Carrier Safety Administration, as well as state-based laws governing commercial drivers’ licenses. 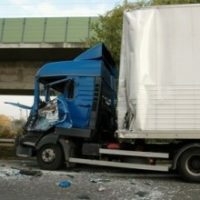 These laws create additional theories under which a trucking company or driver can be found responsible for an accident. For example, a driver may have been in violation of federal laws limiting the number of hours in a day a driver can be behind the wheel. Alternately, a carrier company may have loaded the truck above the legally-permissible load. Finding a lawyer who understands and is well-versed in these laws means that you will have an improved chance of receiving the full compensation you’re owed. If you’ve been injured in an accident with a semi-truck, tractor-trailer, or 18-wheeler in New Jersey, contact the knowledgeable, experienced, and compassionate Wayne truck accident attorneys at Massood Law Group for a consultation on your case, at 973-696-1900.